1. Purpose of This Notice. This notice provides information and interim guidance on air traffic policies and prescribes procedures for the planning, coordination, and services involving the operation of unmanned aircraft systems (UAS) in the NAS. These policies and procedures reflect current written directives and regulations and do not reflect any major changes. The intent of this notice is to consolidate all current directives and regulations into one document to assist with understanding UAS operations in the NAS. 2. Audience. This notice applies to the following Air Traffic Organization (ATO) service units: Air Traffic Services, Mission Support, and System Operations; and all associated air traffic control facilities, the David J. Hurley Air Traffic Control System Command Center (ATCSCC); and the Flight Standards Service’s divisions at Federal Aviation Administration (FAA) Washington headquarters. 3. Where Can I Find This Notice? This notice is available on the MyFAA employee Web site at https://employees.faa.gov/tools_resources/orders_notices/ and on the air traffic publications Web site at http://www.faa.gov/air_traffic/publications. 4. Explanation of Changes. 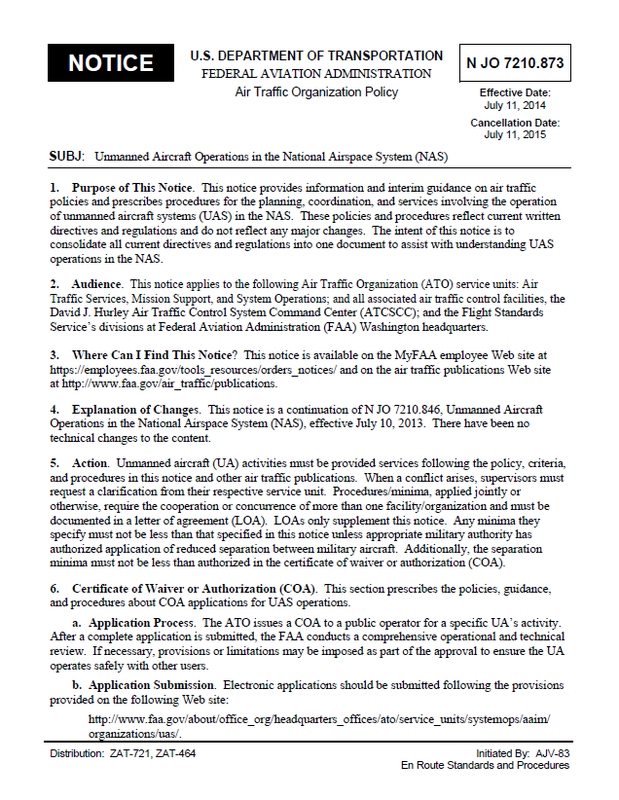 This notice is a continuation of N JO 7210.846, Unmanned Aircraft Operations in the National Airspace System (NAS), effective July 10, 2013. There have been no technical changes to the content. 5. Action. Unmanned aircraft (UA) activities must be provided services following the policy, criteria, and procedures in this notice and other air traffic publications. When a conflict arises, supervisors must request a clarification from their respective service unit. Procedures/minima, applied jointly or otherwise, require the cooperation or concurrence of more than one facility/organization and must be documented in a letter of agreement (LOA). LOAs only supplement this notice. Any minima they specify must not be less than that specified in this notice unless appropriate military authority has authorized application of reduced separation between military aircraft. Additionally, the separation minima must not be less than authorized in the certificate of waiver or authorization (COA). 8. Procedures. UAS operations may occur within Class A, C, D, E, and/or G airspace. Current FAA policy does not allow UAS operations in Class B airspace; however, the FAA will consider exceptional circumstances. Nighttime operations, for all classes of terminal airspace, may be authorized if the proponent requests approval and a safety analysis for such operation is approved by the FAA. (a) Strict compliance with the provisions of the COA is required. (b) Lost link procedures must be clearly defined. Lost link procedures will be pre-coordinated with the appropriate ATC facility and included in the COA. At a minimum, they will include: lost link route of flight, transponder use, lost link orbit points, communications procedures, and pre-planned flight termination points in the event recovery of the UAS is not feasible. (c) In the event of lost link, the UA must squawk code 7600. (d) Direct two-way radio communications with ATC and the UA pilot is required at all times. (e) Compliance with ATC instructions for arrivals, departures, operations within, and through flight is required. (f) Pilots/observers must have an appropriate FAA medical certificate or military/agency equivalent. (g) Pilots must not conduct concurrent or simultaneous UAS operations in the presence of manned aircraft unless approved segregation procedures are written in a letter of agreement with the affected ATC facility and included in the COA. (h) Use of visual separation by the UA pilot is not authorized. (i) UA pilots and observers must be responsible for only one UA at a time. (j) UA operations must not impede, delay, or divert manned operations (for example, excessive departure/arrival delays). (k) UA operations must not be conducted over populated areas. (l) Safety alerts will be issued in accordance with FAA Order JO 7110.65, paragraph 2-1-6. (m) All operations must be conducted under visual meteorological conditions (VMC). (n) Special VFR procedures are not authorized. (o) A certified operating mode C/S transponder must be used. (p) Compliance with mitigations identified in the FAA-approved safety analysis. (q) A NOTAM issued by the proponent.